Apart from that, it's mostly been about the gulling which has continued to be excellent. 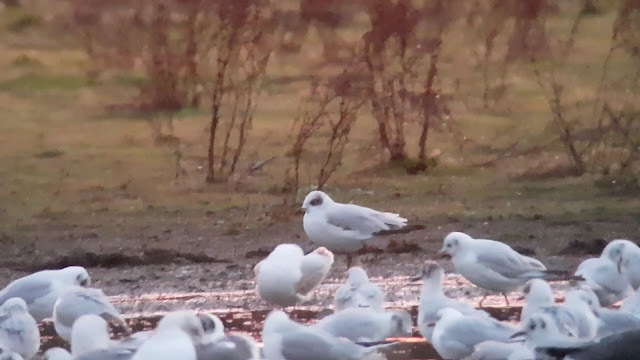 The injured first winter CASPIAN GULL has been around most evenings and we've had a first winter MEDITERRANEAN GULL turn up two or three times as well. Thomas Miller has been finding many of these birds - it's great to have a fellow laridophile to keep an eye on the roost. As far as other species are concerned, there have been up to three SHELDUCK on the floods this week. I also spotted my first Fieldfare of the year in the hedgerow bordering the allotments. Away from the Meadow itself, I have been wandering around the Trap Grounds seeking out the usual suspects for the year list. I managed to hear a squealing WATER RAIL in the reedbed and spotted a fine pair of Bullfinches along the side stream. I also found an over-wintering CHIFFCHAFF by the canal next to the Frenchay Road bridge. To round things off, Steve Goddard had a Grey Wagtail up at the Wolvercote end as well. The floods could do with a bit of a top-up, this settled high pressure system is making for a rather dry spell of weather.